So I have this book-signing opportunity coming up in May 30. Part of my earnings will go toward supporting my place of work, Trinity Services. At Trinity, we provide both a day program and residential services to adults with disabilities. In honor of this event, I’ve decided to give a whole new look to my short story, “Dream Catcher, Heart Listener,” which tells the story of a blind girl. In her dreams, she is visited by a mysterious young man who shows her colors and all sorts of things she would never be able to see in her waking hours. But he won’t show her what he looks like or tell her who he is… Hmm, like what’s up with that? Guess you’ll have to read to find out! The story was previously available only as an ebook, but I’ll be coming out with a print version as well. Something short, sweet, and great for promotional purposes. 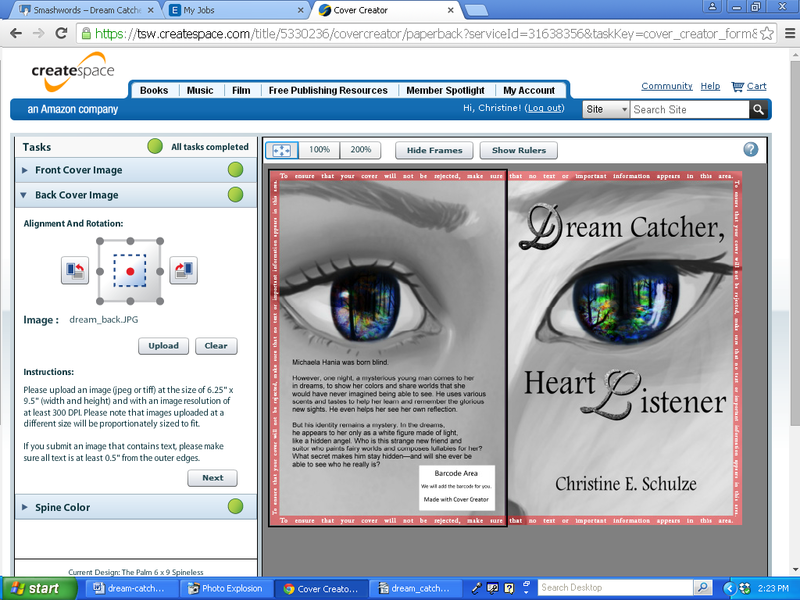 Here’s a screenshot of me putting the cover together on Createspace. Artwork courtesy of Karla O. Thanks, Karla! !